When Andrew picked the recipe meat pies with pea soup from John Torode’s ‘Beef’ cookbook, I must confess I was a bit dubious about it. The combination of pie swimming in soup sounded a bit odd, but I had committed to this Cookbook Challenge and Andrew was getting quite into it, so I thought I should bite the bullet and make his chosen meal. Well, I was extremely pleasantly surprised by the pie, and the pea soup. The pie crust is made using hot water dough (normally used for pork pies and the like) and I’d never made this type of pastry before. The pastry was utterly delicious: it had a texture which reminded me of my favourite pie and mash shop pies, so I am definitely going to make it again. 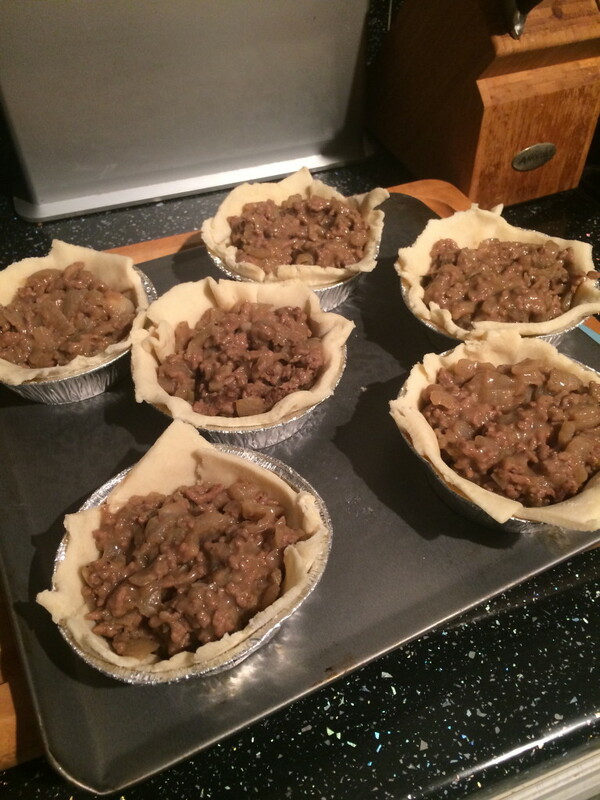 The pie filling was minced beef, and as usual I was tempted to go off-recipe and make the savoury mince according to how I would normally do so, but resisted. The resulting beef mixture had the perfect ratio of meat to thick, peppery gravy. 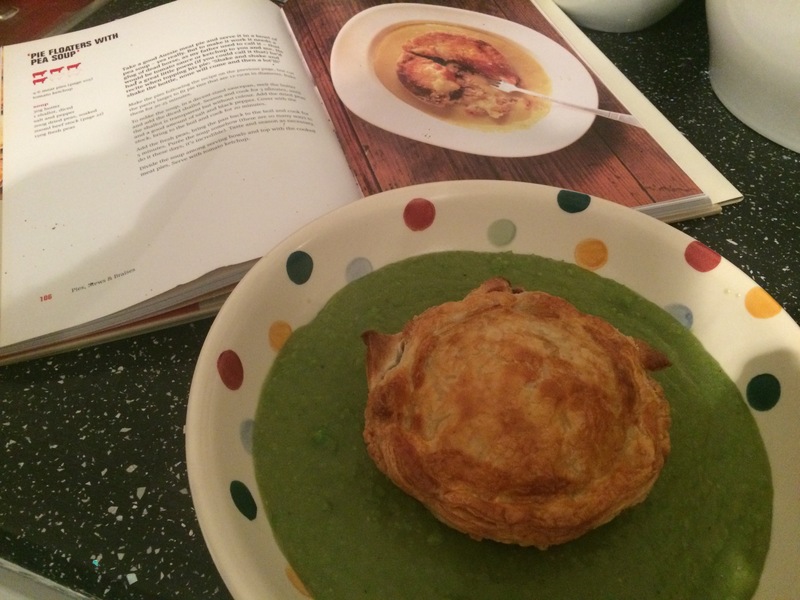 I struggled a bit with the peas: John Torode says in the book that you need to use dried peas. I bought some from Ocado and it turned out they were yellow split peas, which I think are used to make pease pudding. 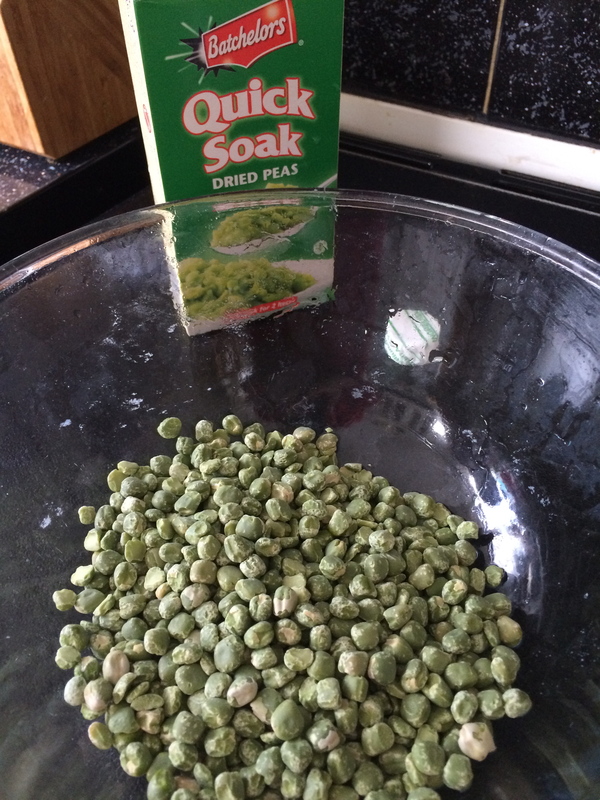 I was imagining that I would need mushy peas, so checked with the Oracle that is my mother, and she explained that it’s possible to buy dried peas from the supermarket to make your own mushy peas – and apparently my Nan used to make them for my Dad all the time. As soon as she said it, I remembered peas soaking on the side in the kitchen with a tablet dissolved into the water! 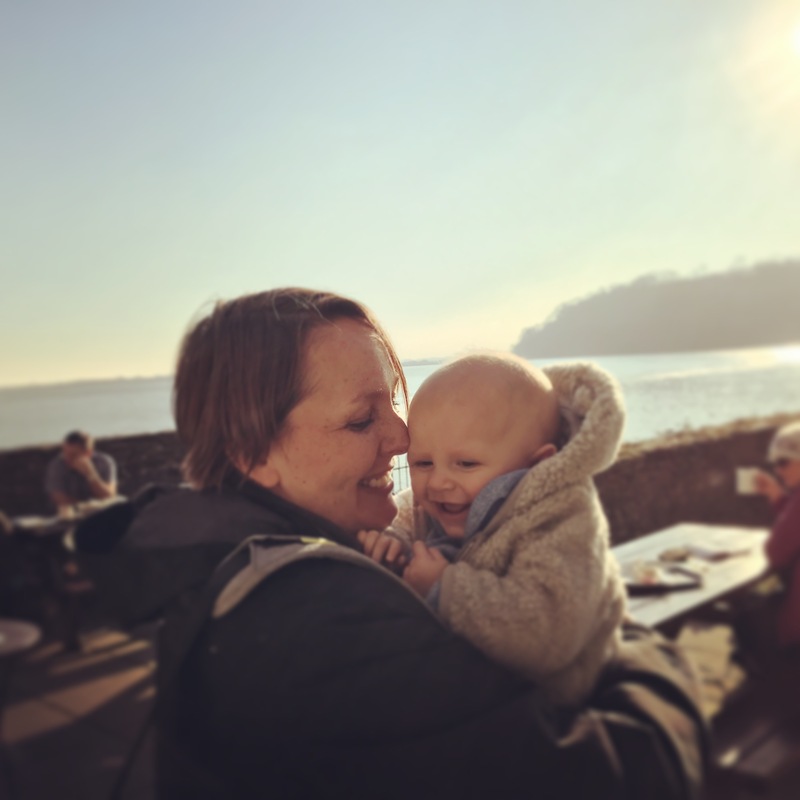 Luckily as mum was visiting me for the day, we went shopping together to Morrissons and found – yep you guessed it – mushy pea dried peas! As I recalled, you had to dissolve a tablet (of bicarb) into boiling water and then soak the peas in the mixture for 2 hours. If, from this, you want to make traditional mushy peas, you simply need to rinse the peas and boil them with a little salt and sugar for 20 minutes until you have the texture you require. I need to play around with the ratio of salt and sugar to water to get my mushy peas as good as the tinned variety, but I am really pleased with my discovery. I found it easiest to make the pastry in the morning and refrigerate it until I was ready to make the pies. I also made the minced beef in the morning so it would be cool enough to fill the pastry later that day. Finally, I got the peas soaking in the morning as well. 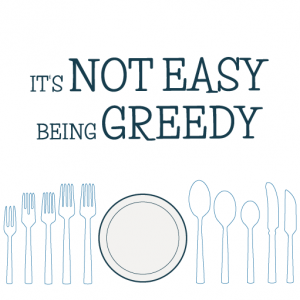 By doing those small amounts of preparation in advance I was able to assemble and cook everything in around 40 minutes, and most of that time was baking the pies in the oven. In case you think the recipe sounds like a right faff, believe me it’s not. The hot water pastry is the simplest pastry I have ever made. 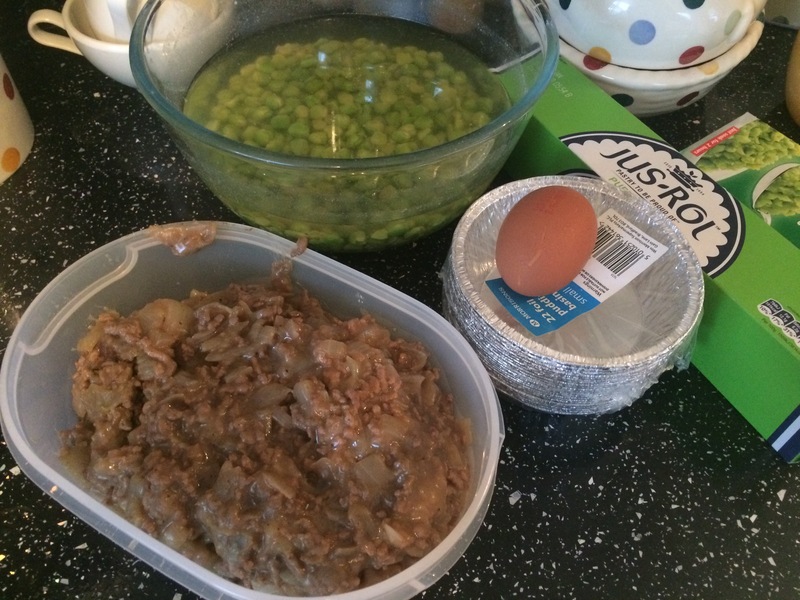 The mince is easy, and the peas take no time to prepare once they’ve been soaked. 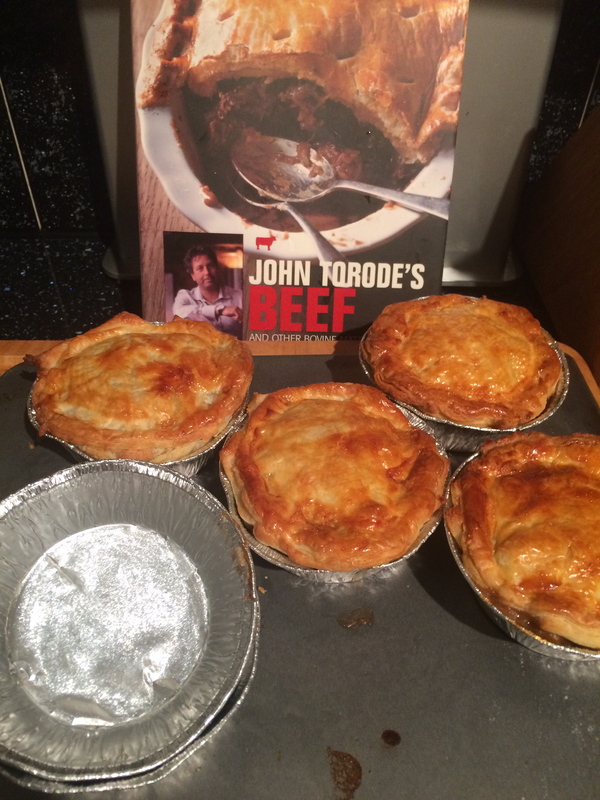 I’d definitely make the whole dish again, and I will be making the pies soon – Andrew wants me to experiment with pie filling but I am pretty impressed with what John Torode proposes in his book, so minced beef pies will be coming our way again! Make the pastry by heating the beef dripping with 150ml water until the dripping has melted, then mix it into the flour and add the salt. Stirring it for a couple of seconds makes the a dough and then you simply need to allow it to rest in the fridge for several hours, or overnight. For the mince, heat the butter in a large saucepan and fry the finely chopped onions until they have softened. Add the minced beef and once it has all cooked (5 minutes should be enough but keep stirring the mince around so it all browns evenly), sprinkle the flour onto the mince, add the nutmeg, soy and oxo cube, then top with water. Stir and gently simmer the mince for 10-15 minutes until it has cooked through, add salt and pepper to taste, and then allow to cool. To assemble the pies, line the base of each pie dish (I used tin foil individual dishes from the supermarket) with the hot water pastry. Fill with mince and top with puff pastry. You can stick the lid to the base by gently wetting the base with water. Brush the top of each pie with egg wash. 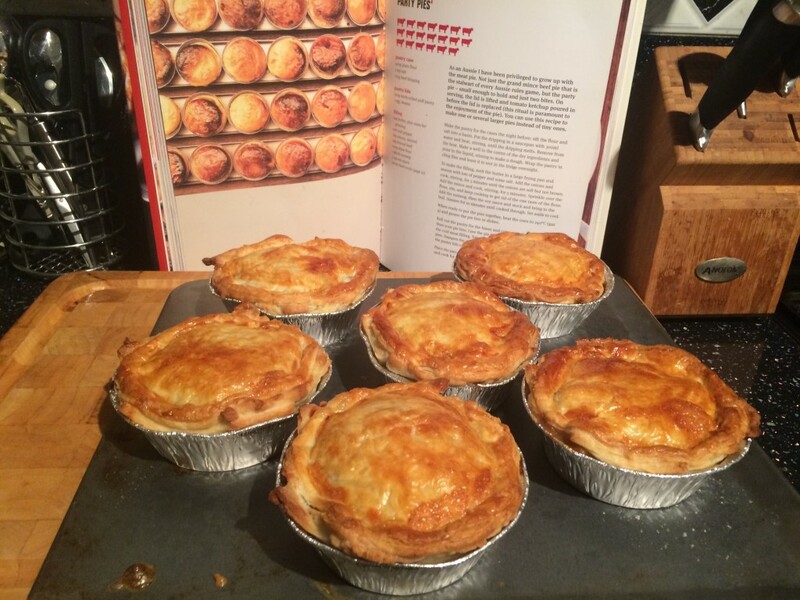 Put the pies into an oven which has been pre-heated to 240 degrees, but as soon as the pies are inside reduce the temperature to 190 degrees and cook for 20-25 minutes. While the pies are cooking, melt the butter for the peas in a pan and add the chopped onion, which you should cook until it has softened. Add the dried peas, salt and pepper, crumbled oxo cube and water and simmer for 20 minutes until the peas are mushy. You may need to add a little more water so keep a close eye on the peas. Then add the frozen peas to the saucepan and cook for a further 5 minutes. Remove from heat and blitz the pea mixture with a blender until smooth. Place some of this mixture into the bottom of a large bowl and top with the cooked pie. 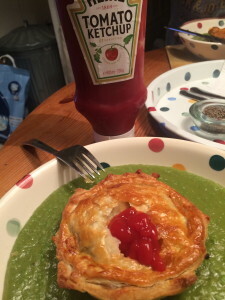 Break open the top of the pie and add a generous squirt of tomato ketchup and dive in! I love the shot of all the pies together after baking. They look great! It’s funny, there is such a rivalry between New Zealand and Australia, I get a prickle when I see the term Aussie meat pies. 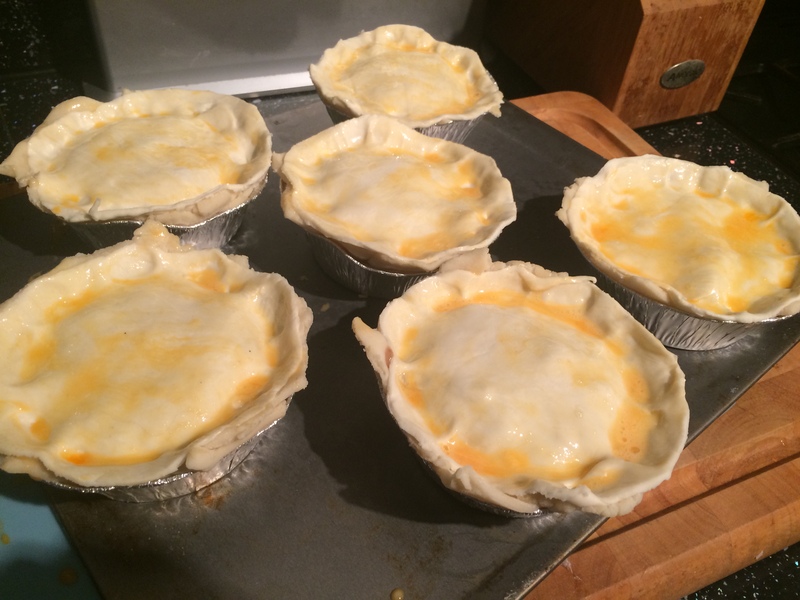 It’s New Zealand meat pies! I bet they’re the same thing, but we defend our pies with honour. 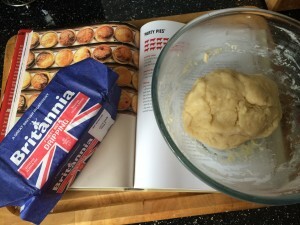 Do Aussie meat pies taste very different to British meat pies? We don’t do mushy peas here in New Zealand, I think it’s more of a British thing. 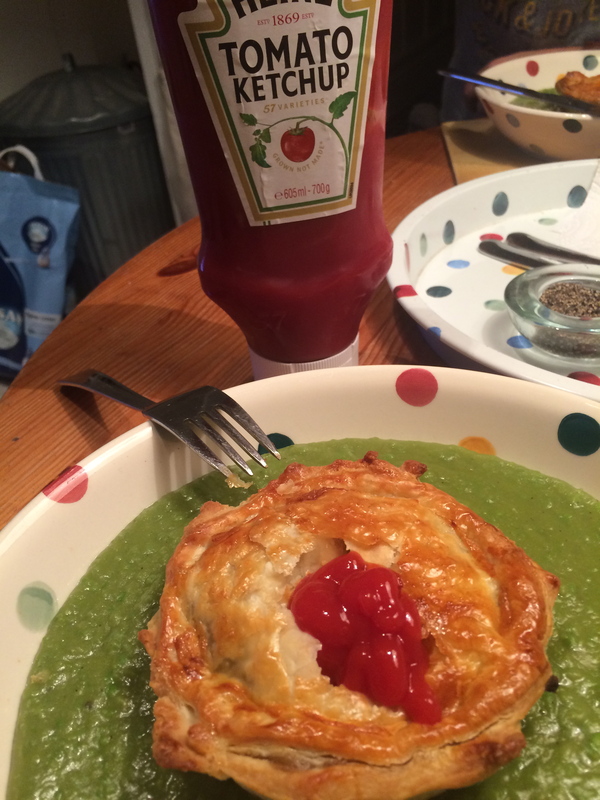 If pies are served with anything it’s tomato ketchup or a pile of chips (or both).